Now that you’ve added your business to the Google business directory and secured your spot on Google maps, your next step is to climb the ladder of the Google local search results. When you search for your category of business in your area, you are able to find your listing, but only after clicking the “+” to show more listings. That’s just not good enough. You know that most people will choose one of first listings, referred to as the lucky 7 [7 box], and that’s where you want your business to be. Here’s how to gather a little intelligence and use your competition’s success to enhance your ranking. 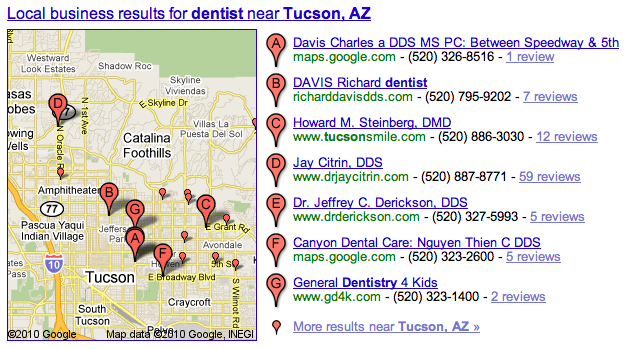 When Google business listings first appeared, 10 results were listed to the right of the map on the initial search page. Later, Google decided to reduce the number of results it highlighted to 7 and add more information to the listing. That’s great news if your business is listed in the top 7; it’s terrible news if you were numbers 8 through 10. The first step is to simply check their information in the Google listing. If you click on “more info” you will see any reviews that have been linked to the business. Reviews play an important part in Google’s algorithm. Even negative reviews will help with you listing ranking, though you probably want to avoid them. When you check the source of the reviews, you will often see that they come from review sites such as Healthgrades.com or a similar niche review site. If your business has no reviews listed on the site, do something to change this. In traditional SEO, back linking still holds the top spot in ranking. For local business listings, then new king is citations. Each time the Google bots find a mention of your business by name, address and phone number, your business gets a point. Though Google won’t confirm it, most experts agree that the more important the source, such as Yahoo, BBB, etc., the more points the citation will bring you. Software is available that will allow you to track all the citations of your competition. Like reviews, if you find a competitor’s citation on a site that doesn’t list your business, then you should try to get it added. Another technique is to check the keywords that the competition is using to get hits on their site. Find the sites that use the same keywords that your site does and check their page rank. This will give you a good idea of how hard it will be to overtake them in the listing results. If your competitors have a page rank of 1-4, then you should have no problem optimizing your site to overtake them. If their rank is a 5, then you’ll [likely] also need a high page rank to get ahead of them. By checking the page rank of the lucky 7, you can get an idea of what you are up against. Keep in mind that it’s not necessary to have a website to have a Google business listing, but those businesses that don’t are at a serious disadvantage. Some of my competitors claim that they can get your business a top ranking in 30 days-I actually can. And one of my first activities is competitive analysis just like I just described. Once I know what the competition is doing, I do it better. You can learn the same tactics and soon you’ll see your listing appearing in the lucky 7 and should see and improvement in business. Google’s search algorithm places a heavy importance on the number of incoming links to your site. These citations come from other sites that list yours and provide a direct link to your pages. For local search engine optimization based off Google Maps listings, the number of pages that simply mention your business’s name, address and phone number is also an important factor. If the citation contains a link to your site, all the better, but it’s not necessary. These references are called citations and can play a tremendous role in your local page ranking. Often these sites are local directories such as those maintained by newspaper websites or local search engines found in larger markets. If you want your listing to appear in Google’s coveted “7 box,” then you need your business to be listed by as many sources as possible. Not all referring sources or citations are the same. The more reputable that Google believes the referring site to be, the greater weight it will carry in the page rankings. For instance, the Better Business Bureau and the Yellow Pages are considered more reliable and authoritative than a small, free local directory listing. That’s not to say that getting listed on such sites is unimportant; every citation counts. There are a few ways to go about building the number of citations your business has. The cheapest way is to do it yourself. Once you have ensured you are cited in the big boys such as Yellow Pages, Yahoo Directory, the BBB, etc., you now need to search out the less obvious sources. 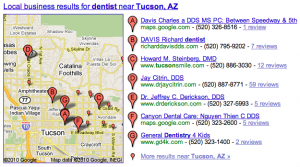 One way to so this is to analyze the listings of your direct competition and related local businesses. Often they will provide you with potential citation sources that you haven’t considered. Once you know their sources, try to get you business mentioned also. We will go more indepth into this tactic in a later article. If you are willing to spend a little money, you can submit your business information to a business listing service. These services ensure you are listed in all the major directories, many of which you would likely have not considered. These services usually charge somewhere around $50 to list in all the major directories. We will review the most popular in the coming weeks. The most expensive and most thorough option is to hire the services of an SEO company to formulate an in-depth online marketing strategy. These services will ensure that your business has as many citations as possible and will also optimize your web pages to make sure they will get noticed by Google. For businesses in competitive markets, this is often the best option. Link and citation building is a continuous process. You must consistently seek new sources of citations and stay ahead of the competition. Try to ensure that your citations remain as consistent as possible when it comes to your business name, address and phone number. In Google terms, consistency is trust. This works well for customers too. One way to really keep on top of things is to make sure you know immediately every time your customers are talking about you. To make this possible we offer our clients a special Local Reputation Management Service so that every mention of your company-good and bad-you can be made aware of. This allows you to turn no reviews into lots of reviews and good reviews into glowing reviews and bad reviews into ‘handled’ reviews. The price for this is a very reasonable $79/month. There is no contract, cancel any time. However, most people love it and stick with it indefinitely. To get started simply click the paypal button below. For years businesses have tried feverishly to find the magic formula that would ensure that their websites would be displayed near the top of the Google results when a search was initiated that pertained to their area of concern. Business spent billions in advertising dollars in an attempt to this. Just about the time Search Engine Optimization came into its prime, Google went and changed the whole game by introducing Google Maps and Local Business Center. Now it wasn’t just good enough to be on the first page in global search results, businesses needed to be near the top of the page on these localized results. Understanding this is just a small part of local SEO. For years, the Yellow Pages, newspapers and local radio have seen steady drops in their advertising sales due to increased consumer use of internet searches to find what they are looking for. Many newspapers and some radio stations began offering a local search feature on the websites to increase page hits and ad revenue sales. Eventually the sites began tying the searches into the Google Maps feature to offer a very customized local search service that would narrow businesses down to the exact street. Google of course saw this and knew they could do it better, and they did. These days, the new trend is local Search Engine Optimization for Google Local Business Center. The basic idea behind Business Center is that it allows business to manually enter their business information using the business Center dashboard. This allows savvy businesses to quickly rise in the search result rankings. The information entered will undergo a verification process by Google to ensure it is accurate and then the site will be automatically indexed. Like many things Google, the exact method they use to rank pages is a closely guarded secret, but there are some things you can do to raise your sites page rank. The first and easiest thing to do is make sure that all information is filled out in the listing as completely as possible. Basic stuff such as address and phone number is pretty simple, but the last two sections, description and category, are where the men are separated from the boys. Think of the description as a miniature web page. It should stick to the basic tenets of SEO and use keywords specific to your business. Books have been written on SEO so it’s outside the scope of this article, but by thinking like a customer looking for your business, you can tailor the description to match that search. Category is also important in that it is heavily weighted when consumers browse Google business listings. In this section you must think like a Google categorizer as well as a customer. You can only choose five so think carefully. Customer reviews of your business play big role in the rankings. Businesses with more reviews will be considered more popular and will therefore rank higher. Included reviews are those posted directly to your listing as well as those posted on other popular review sites. Encourage your customers to leave feedback if they are happy with your service or product and watch your ranking climb. Since you can list a website on your listing, make sure this site is also well optimized for search results since it will now be automatically linked to your Business Center listing. A complete and informative website, complete with a blog and customer reviews, is the optimum situation. Since Google “crawls” other local directories looking for information, make sure you manually add your listing to as many of these sites as possible also. Though you may not get as much traffic from these smaller sites, the listings will translate into Google results. Google Business Center is a great resource for consumers and businesses alike. Take advantage of what it can offer and you will see your business grow.